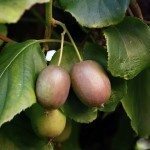 I live just an hour north of San Francisco and would like to know when I should plant kiwi vines. Thank you. Bare root kiwi vines should be planted in early spring, but after the last frost. Kiwi vines previously grown in containers can be planted in spring or in early fall.